The Afforestation Grant Scheme (AGS) started in 2008, providing up-front funding for land-use change to forestry. It is coming up ten years since some of the first contracts were signed, and therefore contracts will be starting to expire. This provides an opportunity for landowners that took up a grant to consider entering AGS forests in the ETS. If you have AGS forests planted in 2008 – 2009, feel free to get in touch to discuss options for registration. Tiwai Point Aluminium Smelter is looking at new technology that could eliminate all direct greenhouse gas emissions from the smelting process, instead producing pure oxygen. Stuff.co.nz has reported that technology is being developed by a joint venture between Tiwai majority shareholder Rio Tinto and American company Alcoa, and it is hoped to be ready for market by 2024. An emissions reduction project such as this could be very positive for NZ emissions, given that aluminium production in New Zealand generates approximately 580kt of CO2-e per year (according to MfE data for 2008-2016). 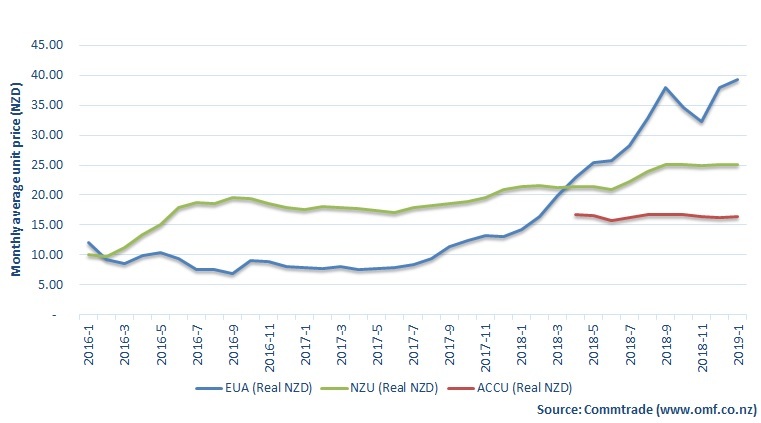 The NZU market has been characterised recently by pricing at or around the $25.00 mark, in line with the fixed-price option that persists at least for the current surrender period. Emitters can now start to process emissions returns for the 2018 year, and some may decide to hold acquired units and utilise the fixed price option instead, in order to hedge against the price rising before next year’s surrender. EUA prices rose by €4.50 during the month of December to finish the year at €25.00. January has seen the market soften, with trading at the end of January around €23.00 (NZ$37.00).